Sikkim– The breathtaking view and the amazing ambiance are what make your stay beautiful at Sikkim. Whether you are planning a thrill-filled trip with your group of friends or you are in the mood for a relaxing vacation with your family, Sikkim has everything in store for you. One of the fascinating facts about Sikkim is its warm people and culture. While exploring Sikkim, you will get to interact with the local people, who are mainly Bhutias, Nepalis, and Lepchas. The warm and friendly nature of the locals makes you feel absolutely at home. In fact, I enjoyed my stay at Sikkim mostly because of the local people I got to interact with. Right from knowing about their religious faith and festivals to tasting their homemade delicacies – it was a fabulous experience that I would love to cherish for the rest of my life. Quite interestingly, you can witness a perfect coexistence of Buddhist monasteries and Hindu temples in Sikkim. In fact, I was simply amazed to see how people from different religions have managed to preserve their individuality with absolute peace. I experienced quite a smooth and comfortable stay in Sikkim as the state is well organized and supervised by the state government. Just one thing to keep in mind is you can’t violate the basic rules like smoking or consuming alcohol in sacred places or disturbing the wildlife or its habitat. But then, these are some basic rules that we have to follow at any tourist place, right? Well, you can rest assured of complete security and safety during your stay at Sikkim. All the different parts of Sikkim offer a wide range of accommodations and other facilities. The budget that you require entirely depends on how lavishly you want to stay. Right from the budget hotels to the luxury boutiques – you can choose anything according to your preference and quite obviously, the budget varies accordingly. However, if you are planning a moderate trip, you can set a budget of around INR 1500/- that will cover your stay as well as food and miscellaneous costs. Make sure you over-budget to a certain extent as it will help you avoid any kind of cost crunch. Sikkim is a beautiful state with multiple things to see and do. I personally believe at least 5-7 days (excluding travel days) are required to explore the four different parts of Sikkim (East, South, West & North), but if you are planning a longer trip, you won’t regret it for sure! Lesson days? no worries, you can still get the best of Sikkim that includes Gangtok and nearby sights in 2-3 days. I suggest you keep your stay in Gangtok and hire a local taxi with a driver who can guide you for the sightseeing. WHEN TO VISIT SIKKIM: RIGHT SEASON? SUMMERS– If you are looking for a lovely and pleasant stay, visit Sikkim during the summers, i.e. from April to June. The temperature varies between 5 and 25 degrees. However, the nights are quite chilling and hence, you need to pack in sufficient woolen clothes. During this time, it’s ideal to visit Yumthang valley, Gurudongmar lake, and Rumtek monastery. MONSOONS – Since Sikkim faces moderate to heavy rainfall, the temperature falls to quite a great extent. With a temperature range of 4-15 degree Celsius, Sikkim is quite chilling and pleasant between July and September. Though there is a slight risk of landslides, you can grab some great deals on the hotels. On top of that, the destinations are also less crowded – what else do you need! WINTERS – If you are looking for an extremely chilly vacation with snowfalls, definitely plan your trip during the winters, i.e. from October to March. Usually, the temperature stays between -5 degrees and 7 degrees during this season. The route to Gurudongmar from Lachen might be frozen making the lake inaccessible. There’s might be a thick sheet of ice on the road resembling an ice-skating field. It’s slippery and too risky to be driving on. Check out the local weather condition & rely on expert local advice. Average temp in Lachung/Lachen remain between -5 to -12 deg Celsius during pthe eak winter season. If Gurudongmar isn’t happening due to frozen route, your driver/guide might offer to take you (at an extra cost) to Kalapatthar, which offers views of snow-laden landscapes. The place actually resembles a stone quarry and is occupied by army cantonments with restricted civilian access. You may find some snowfall there. However, we think if you really want to go there. While in Gangtok, skip the local sightseeing package and rather explore the town on foot. The flower exhibition center and cthe ity’s football stadium are popular attractions. The drive to Nathula-Baba Mandir-Tsomgo lake is a one-time must do, but expect these spots to be crowded with tourists. A rather off-beat trip would be a drive to Lathang valley from Gangtok and night stay at Zuluk village for splendid vistas of the valley during the day and a glittering night sky overlooking a dazzling Gangtok visible from a distance. In case you’re game for some trekking, head to Yuksom from Gangtok (4-hr drive) and trek to either Dzongri top (4 days) or all the way to Goecha La pass (7 days) for splendid views of the eastern Himalayas. A road trip through South and West Sikkim comes recommended. Lastly, you may visit the Sikkim Himalayan Academy and volunteer to teach young children from nearby villages. Your stay there would be free and you may donate to the academy any material you think would help in educating the kids. With a lot of vibrancy in culture and tradition and a magnificent view of the Kanchenjunga, Gangtok never fails to amaze its tourists. Being the center of Tibetan Buddhist learning and culture, Gangtok is frequented by wanderers, eco-travelers and history buffs from different parts of the world. Surrounded by a lot of stunning sceneries, with a little dash of city life, Gangtok has turned out to be one of the most popular tourists’ destinations of Sikkim. It’s also the capital of the state and hence, is home to a number of administrative organizations. Whether you are craving for a relaxing vacation amidst the snow-clad mountain peaks, or you are up for a thrilling and adventurous tour this time, Gangtok tourism won’t disappoint you. Being the Sikkim capital, Gangtok happens to be the base for exploring other off-beat parts of Sikkim. It’s known to be one of the cleanest places in India and most importantly, you can enjoy some delicious food and good music in the pubs and restaurants over here. Gangtok is home to the different group of people including Nepalis, Bhutia and Lepchas and it’s really amazing to experience the colorful fusion that they create by coexisting together. No matter whether you are planning a Gangtok tour with your friends or you are planning a much-awaited family vacation, it’s important to know the essential details well in advance. The city is fairly compact, so it only takes a few days to see the major sights. We recommend spending two or three full days in the city. You could spend more, of course, but two or three will give you a good overview of the city. 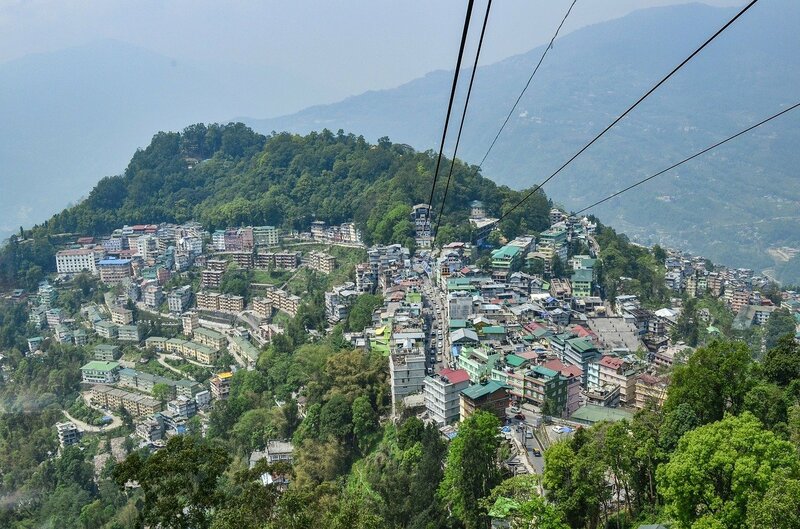 Gangtok does have a handful of nice day trip options, so you may want to extend your stay by a few days to experience those sights or just chill & relax. Pay a visit to Rumtek Monastery – a must-do! – Also known as the Dharmachakra Centre, Rumtek Monastery is one of the key attractions of Gangtok. Built during the middle of 1700, under the direction of Changchun Dorje, the monastery has been renovated in the recent past, with the help of the royal family of Sikkim. Located amidst beautiful waterfalls and majestic hills, this gompa is an epitome of peace. It’s also a visual treat for the tourists, as the massive prayer hall of the monastery is decorated with some splendid statues, tangkhas, and murals. Enjoy the scenic beauty of Tsomgo Lake – Located at a distance of 35 km from the city of Gangtok, it’s one of the most famous tourist spots of Gangtok. Considered as a holy lake, this lake is home to a number of small temples, which are dedicated to Lord Shiva. Apart from holding a very special religious value, this place is scenically beautiful as well. Check in at Nathula Pass – Located at a distance of 56 km from Gangtok, this pass is used as a corridor to bridge the gap between India and Tibet. Richly surrounded by alpine flora, it happens to be one of the highest motorable roads in the world. On a sunny day, one can also view the Chumbi valley, while traveling through this road. Pay a visit to Hanuman Tok – The term “Tok” means temple in the local language and Hanuman Tok is a temple, dedicated to Lord Hanuman. Apart from the religious aspects, the temple is famous for offering a surreal view of the Kanchenjunga and boasting a serene atmosphere. In order to enter the temple and offer puja to the Lord, visitors need to climb up quite a few stairs as the temple is located at an altitude of 7200 feet, approximately. Head to Do Drul Chorten Stupa –Built by Trulshik Rinpoche, the head of the Nyingma order of Tibetan Buddhism, this stupa is home to religious components like Dorjee Phurba and Kangyur relics. Around he Chorten, there are 108 prayer wheels which are turned during the prayers. Located near the Tibetology Institute and Gangtok Centre, the stupa remains open all days of the week from 8 am to 6 pm. Trek to Kanchenjunga – If you are an adventurous soul within, this is an opportunity you would hardly like to miss. Recently opened for trekking in India, Green Lake Basin Trek and Goecha La Trek are some of the most wonderful treks that would lead to a mind-blowing view of the majestic Don’t forget to take the required permission from the authority though. Explore the beauty of Bakthang waterfalls – If you are more interested in enjoying the natural beauty of a place, you would be more than delighted to visit this waterfalls. Originating from Ratey Chu, the main source of water of Gangtok, this is a picturesque natural attraction. You can enjoy a bird’s eye view of the surrounding as well as the amazing scenic beauty while visiting this place. Moreover, if you have a knack for photography, you are surely going to have a gala time at this place. Enjoy the beautiful Saramsa Garden – Constituted by the forest department of the Indian government in the year 1922, this is a beautiful garden, located around 14 km away from Gangtok. This garden is home to some of the rarest plants of Sikkim and beautiful species of exotic orchids. Explore the Fambong La Wildlife Sanctuary – If you are a wildlife lover as well as a photography enthusiast, you would just love to explore this sanctuary on your own. Being home to unique species like Himalayan Beer, Civet Cat Binturong, and Red Panda, this place attracts a lot of tourists. The best time to visit the sanctuary is between September and December as well as March and May. You can also witness the beauty of a wide variety of rhododendrons and wild orchids here. The reserve is also home to different species of butterflies and birds. Gangtok is an upcoming destination for budget & backpacking traveler. We compiled a list of best hostels in Gangtok. Check out the list or we recommend Hostelworld.com to check out for more information.